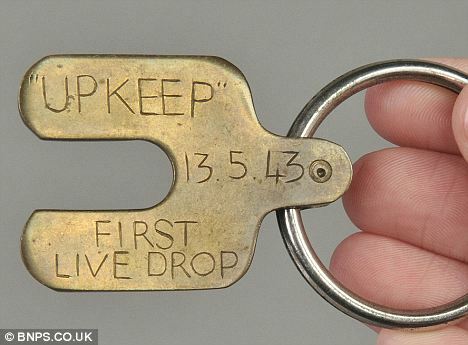 It’s a completely unique artifact, of course, but you do wonder what the lucky purchaser is going to do with it… It’s the key which was used to unlock the mechanism on the only ‘live’ practice flight with the bouncing bomb, which was undertaken by Sqn Ldr M V (‘Shorty’) Longbottom on 13 May 1943. Longbottom was an experienced RAF pilot who at that time was attached to Vickers Armstrong for test flying. He was killed in a flying accident in January 1945, while testing a new aircraft for Vickers. His medals, and a lot of other archive material, was recently sold by Dominic Winter Auctions. Abandoning Reculver for security reasons, [Longbottom] flew south-west to north-east and dropped a Torpex-filled and fully armed Upkeep from 75ft five miles off Broadstairs. Spinning at 500rpm, it bounced seven times over ‘almost 800 yards’ without deviation. For this trial the theodolite camera was positioned ashore on the North Foreland almost broadside to the aircraft’s track, and Handasyde [another test pilot] flew the other Lancaster at 1,000ft and 1,000 yards away from Longbottom, with two cameramen aboard to operate the normal-speed camera. Handasyde had Gibson as observer, and Wynter-Morgan flew in Longbottom’s rear turret to watch the behaviour of the mine after release as it slowed to 55mph behind the aircraft. The film of this test showed that the water-spout when the mine exploded rose to about 500ft above Handasyde’s aircraft, and the estimated depth of detonation was about 33ft. For all concerned the day was eminently successful.